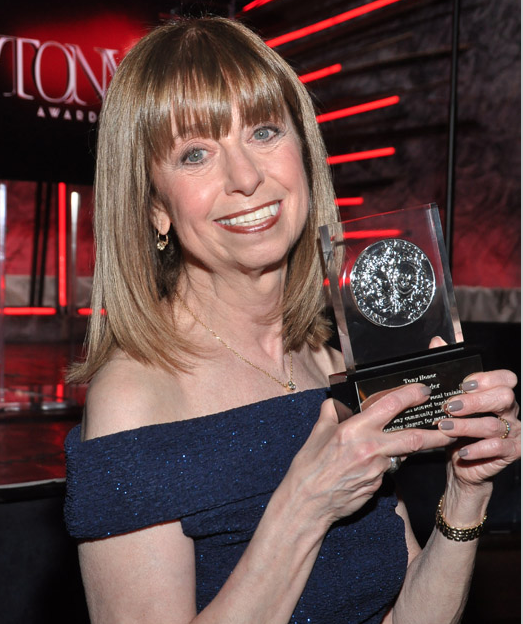 Joan Lader received a special Tony Award in 2016 for her work as one of the most sought-after vocal coaches and voice therapists on Broadway. For more than thirty years, Broadway stars have looked to her to help them keep their vocal instruments in good health. However, singers of all kinds, including stars like Patti LuPone, Hugh Jackman, Sting and Madonna, among many others, have relied on her legendary expertise and advice. In addition to her professional practice, Lader is a member of the Artistic Advisory Board for the Manhattan School of Music new Musical Theatre program and a guest lecturer at colleges and universities that include Columbia University, Pace University, Yale, The Voice Foundation in Philadelphia, The Pacific Voice Foundation in San Francisco and Berklee College of Music. Stay Thirsty Magazine was honored to visit with Joan Lader in New York City for this Conversation to learn more about her important work. STAY THIRSTY: You received a special Tony Award in 2016 for your dedication to the Broadway community. 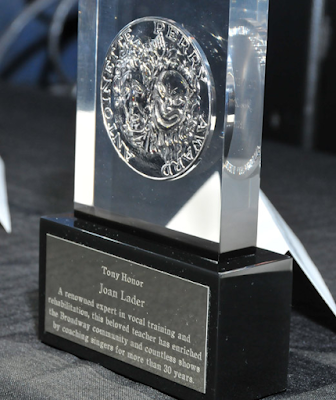 Your nomination was supported by Tony winners Hugh Jackman, Patti LuPone and Kristen Chenoweth, to name just a few. How do you feel about your role in helping some of the greatest Broadway stars preserve their vocal abilities? JOAN LADER: I was fortunate to be one of the three Tony honorees recognized for Excellence in the Theatre. We represented three behind the scenes disciplines: Seth Gelblum was a theatrical attorney at Loeb and Loeb and Sally Ann Parsons founded Parsons-Meares with her late husband. She heads the most prestigious costume shop on Broadway. Recognition as a voice therapist and teacher was beyond anything I could have imagined. I feel so fortunate to be part of the theatrical community doing this work for so many years. It is extremely rewarding to be in a position to help artists who are so dedicated to their craft. And above all, I’m so honored to be part of the creative journey with these performers. They are all so different in their talents and temperaments, which is certainly a contributing factor to what makes the work so interesting. STAY THIRSTY: You have worked with singers and actors with injured voices as well as Broadway, opera, pop and rock singers during your storied career. What have you learned from some of today’s greatest talents? What gives you the most personal satisfaction in your work? JOAN LADER: I think the question has to do with the differences in working with injured singers vs. healthy singers. There is a difference between vocal therapy (rehabilitation) and training (habilitation). If a singer develops nodules, polyps, cysts, is suffering from reflux or has some thickening of the vocal folds, the job is to try to restore the larynx to a healthier state. Often these singers are referred back to their original voice teachers following therapy. Training involves working on endurance, stamina, flexibility and perfecting different vocal qualities. Pop/Rock singers are very different from Broadway singers and certainly different from opera singers. I love delving into all of these genres. I do a lot of cross-training which involves singing in many different styles and many different types of music. STAY THIRSTY: How do you go about helping a performer sustain his or her voice when they have to give eight Broadway performances per week? How important is diet and sleep to your secrets of vocal success? JOAN LADER: That’s such an important question. Vocal health and hygiene are the first topics to be addressed when dealing with a professional singer, especially when they will be performing eight shows a week. It’s best to think of these performers as “vocal athletes.” If you compare them to a football player or a boxer, they all have a team. In sports, there is the trainer and the orthopedist and for singers, it’s the otolaryngologist. In sports, there are physical therapists and for singers, there are vocal therapists. Both rely on coaches, massage therapists, osteopaths, chiropractors, etc. The three major areas I investigate before vocal training are: sleep (how much sleep do you need and do you get it? ), hydration (systemic/ drinking water and surface/steaming) and medical history, including medications, is extremely important to investigate. Where do you feel tension in your body, e.g., neck, shoulders, jaw, larynx and what can we do about it? How would you describe the level of stress in your life? Training varies depending on the needs and the knowledge of the student. Although, imagery is extremely helpful for many students, I think it’s essential that they have some understanding of basic anatomy and physiology. A solid technique is essential for Broadway performers who are asked to do so many more things than just sing e.g. speak, shout, cough, cry, dance, etc. Warming up should be done carefully, slowly and methodically. There are many areas to be covered during a basic warm-up. Warm-ups should include exercises that increase range, smooth transitions between registers, facilitate and inform students moving from head to chest register or thick folds to thin folds and most important, enable them to produce any sound, with the least amount of effort. STAY THIRSTY: Does your guidance to a singer about their voice change based on the genre of their work, i.e., Broadway, opera, rock n’ roll, etc.? On whether they are male or female? STAY THIRSTY: As performers age, what really happens to their voices? JOAN LADER: I’m actually about to present a paper on the “aging voice.” The body begins the aging process at a young age, often by the fifth decade and then beyond. However, people age at different ages and different rates. Genetic makeup may be a determining factor. It’s interesting, that as women age, their voices often deepen. Conversely, men’s vocal folds may become thinner and the pitch will rise. Dr. Steven Zeitels, a famous otolaryngologist from Boston, has been doing extensive research on the rejuvenation of vocal folds. He states that “as vocal membranes are used more, they become fibrous and stiff resulting in a diminished amplitude of vibration.” Other contributing factors to the aging singer’s voice may be due to arthritis, cartilages that begin to ossify, bowing of the vocal folds, dryness, reflux, loss of muscular tone and tension or simply from lack of stamina which is exacerbated when a singer doesn’t continue to exercise their instrument or practice repertoire. Watching Tony Bennett, Marilyn May, Barbara Cook, Barbra Streisand and Plácido Domingo are examples of people who continue to perform, and with great success in their 70s, 80s and 90s. STAY THIRSTY: Can you teach someone to be a great singer? STAY THIRSTY: You are on the Artistic Advisory Committee of Manhattan School of Music’s (MSM) new Musical Theatre Program and a member of its Steering Committee. What do you expect to achieve with this new course of study at MSM? JOAN LADER: I am hopeful that this program will provide students with the tools to enter this demanding artistic field. It’s exciting to have a new conservatory program in New York City; nothing compares to actually being exposed to theater here. The curriculum appears to be diverse, and well-structured. The faculty is experienced and is as excited about the school as the students are. The facility is beautiful and I hope that the program will continue to thrive. STAY THIRSTY: How important is it for MSM students to interact with Broadway veterans and what advice do you have for aspiring Broadway actor/singers regarding their voice? JOAN LADER: MSM students must live and breathe theater if this is really the career they want to pursue. They should immerse themselves in its history, both past and present, and, if opportunities arise to talk with, interact with or perform for theater veterans, they should leap at the chance. The advice I give all aspiring actors and singers is basically the same. Take the time to understand, play, protect your instrument and answer these key questions: 1) How does your voice work? 2) What do you need to know to keep it healthy? 3) Can you tell when a problem arises? 4) Do you have a team you can rely on for help (voice teacher, coach, otolaryngologist)? 5) Can you imagine doing anything other than performing? If your answers to these questions are all “Yes,” journey on!